It’s the sweet things you do that make us smile. Aren’t you sweet! Thank you honey! Daddy and I are so proud of your work. Good belief in yourself! You did it!! Than you for your help! You are an “egg”cellent (excellent worker). Thank you for always saying please and thank you. You are “egg”tra special. We love spending time you with you. You are “egg”tra (extra) sweet. You are sweet to help! Thank you! You really made us smile today! Thank you! To download our full list of positive phrases, egg praise. You could even use this idea without the extra money. Just a positive praise would be a lovely reward. For a fun math game, consider creating a matching game. My middle daughter loves collecting recyclable goods for her play kitchen. I found twelve containers and labeled them with a variety of change amounts. Then, I took an empty egg carton, placed twelve plastic eggs with the matching coins. 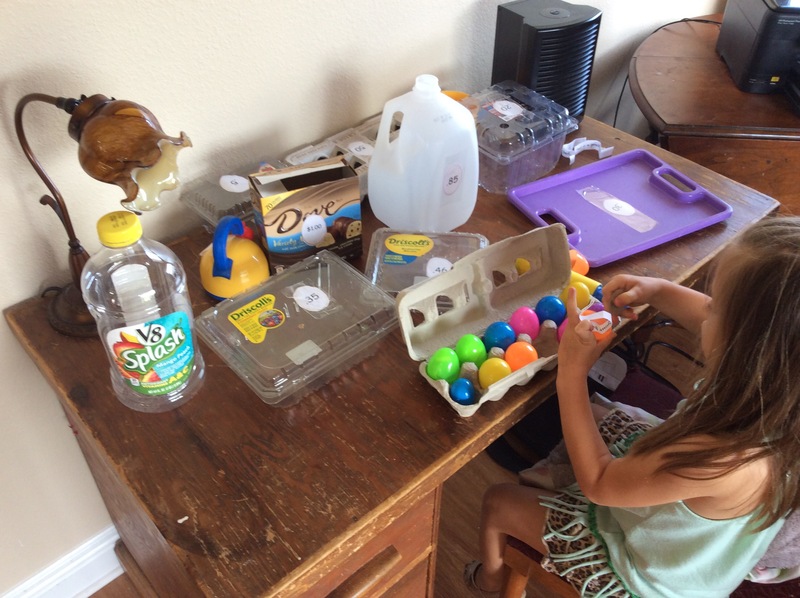 The recycled items and plastic eggs were placed into a “center” bag for her to pick up and practice her math skills. This fun activity could be used in all sorts of math matching activities. Matching larger amounts of money for older students. Last year I created an adventure race for my daughters spy party. Ever since then treasure hunts are requested for every celebration. 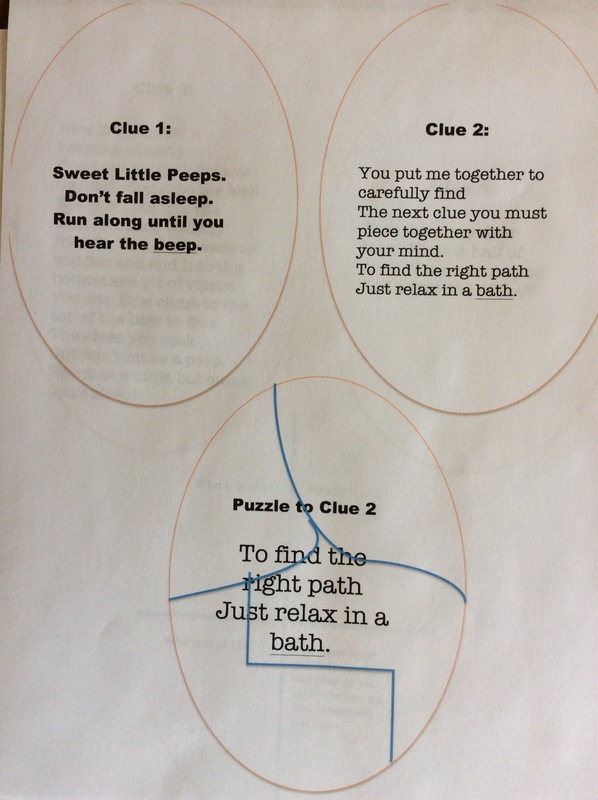 Using the same format from last year’s race, I have come up with an interactive Easter Egg Treasure Hunt. 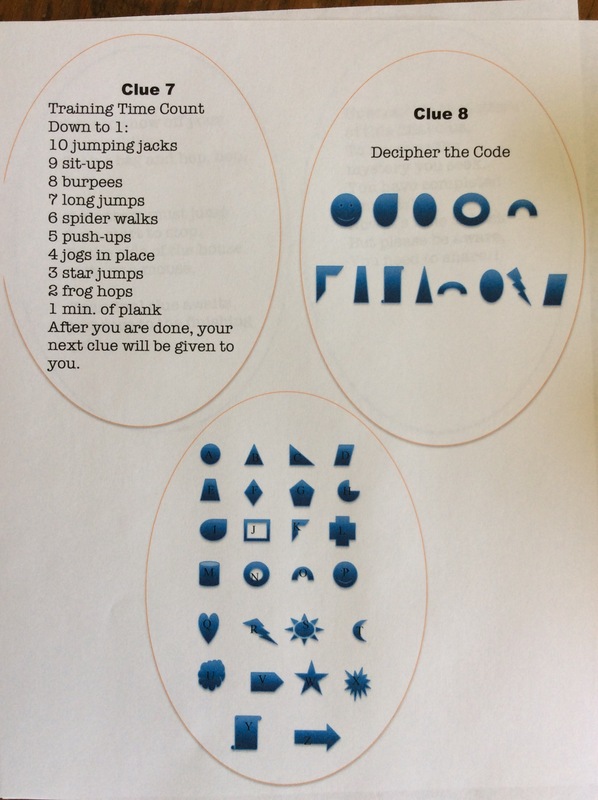 Each clue created has activity that is either a mind puzzle or an athletic event. The clues are placed in plastic eggs and pre-dispersed according to the destination. 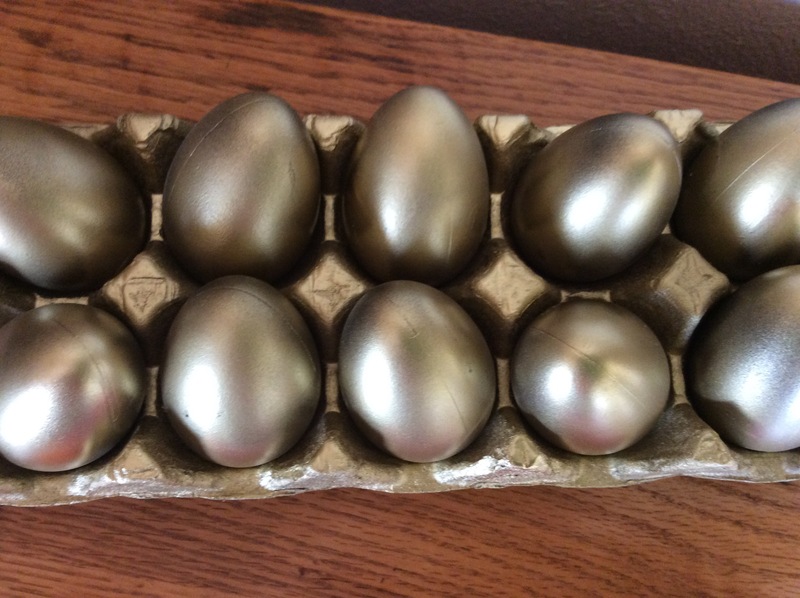 To create golden eggs, I found chalk eggs at Target in the $1.00 bin and used spray paint turn them into gold. Here are the clues I wrote. Clue 1: Sweet Little Peeps, don’t fall asleep. Run along until you hear the beep. The clue in the Car. Clue 2: You put me together to carefully find the next clue you must piece together with your mind. To find the right path just relax in a bath. Clue Three: Now it’s time for a training of sorts. Head out to the “obstacle course”. Hop onto the logs but don’t fall into the bogs. Balance well my friends, you don’t want to wiggle and end into the bottomless pit of vipers you see. Now climb to the top of the bars to free the clues you seek but don’t make a peep. Silent as a ninja but quick don’t sleep. The next clue is outdoor near our pull-up bars and pretend obstacle course. 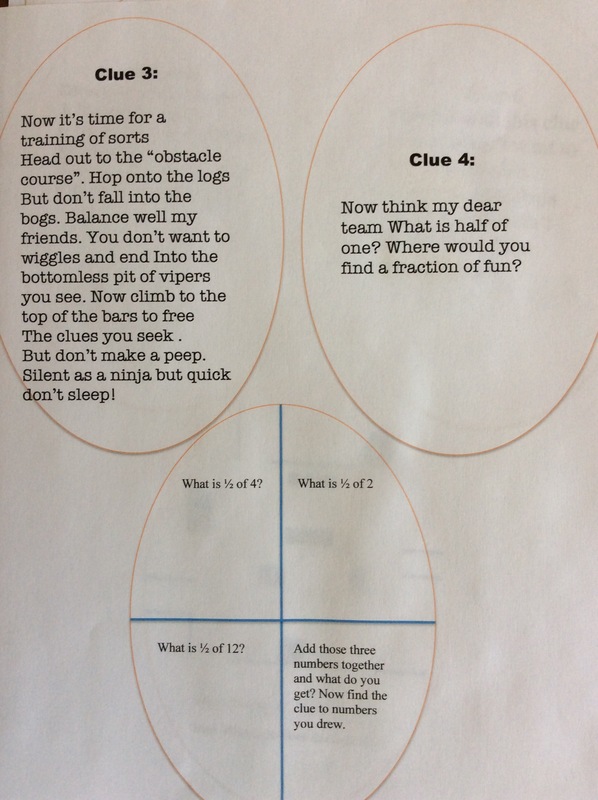 Clue Four: Now thing my dear team, what is half of one? Where would you find a fraction of fun? What is 1/2 of 4? What is 1/2 of 2? What is 1/2 of 12? Add those numbers together and what do you get? Now find the clue in the numbers you drew. The numbers connect to display our house number. The next clue will be in our mailbox. Clue Five: Directional Challenge: X marks the Spot. 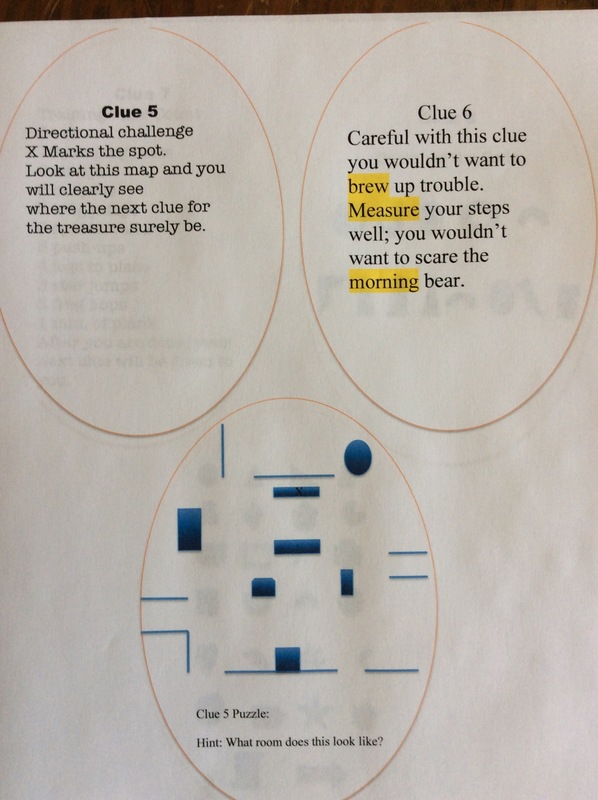 Look at this map you will clearly see where the next clue for the treasure surely be. The map is a picture of our living room. The clue is hidden in the treasure box on top of a cabinet. Clue Six: Careful with this clue you wouldn’t want to brew up trouble. Measure your steps well; you wouldn’t want to scare the morning bear. The next clue is by the coffee pot. 1 min. of plank. After you are done, your next clue will be given to you. Clue Nine: Time to Show off your bunny skills. Grab a bag and hop, hop, hop. Your team must jump from start to stop. To the side of the house, quite as a mouse. Your final clue awaits, just race to the finishing gate. This activity is a race with Walmart fabric bags hopping along the side of the house. Clue TEN: unscramble the letters of this final clue, to uncover the mystery you seek. You have completed your task. Now is’t time to bask. But please be aware, you’ll need to share!! Spring has arrived and with it creative Easter projects. 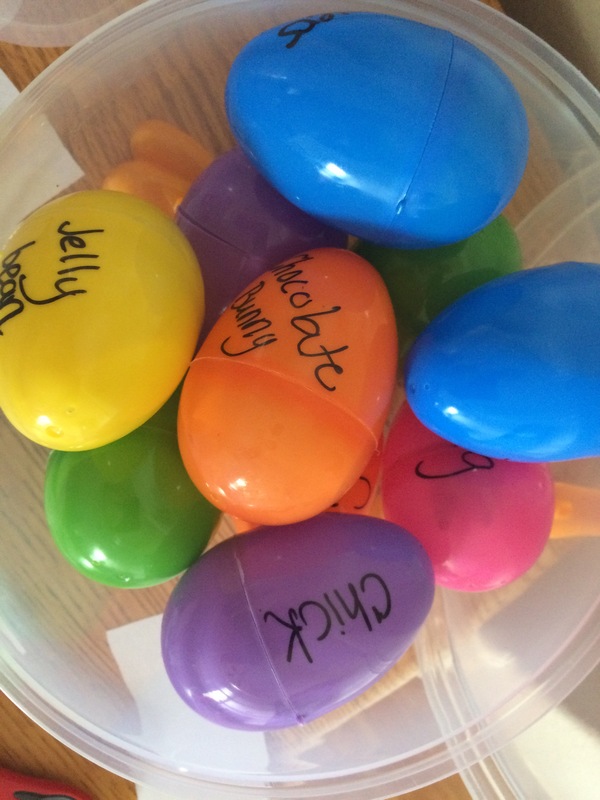 Check out today’s Easter Egg activities. Shoot, swing, kick for each letter as you spell. Start each letter, grow louder until you reach the end of the word. Spell your word with a pirate voice. Spell your word like an opera singer. Spell your word with a little baby voice. Spell your word in a squeaky mouse voice. Spell your word in a lions roar. Spell your word in a robot voice. Do a jumping jack for each letter you use in the word. Spell your word with a farmer voice. Spell your word like royalty with a British accent. Hunt for your word in a book. Sparkle write your letters to spell your word. Write your letter with an expo marker on the mirror. 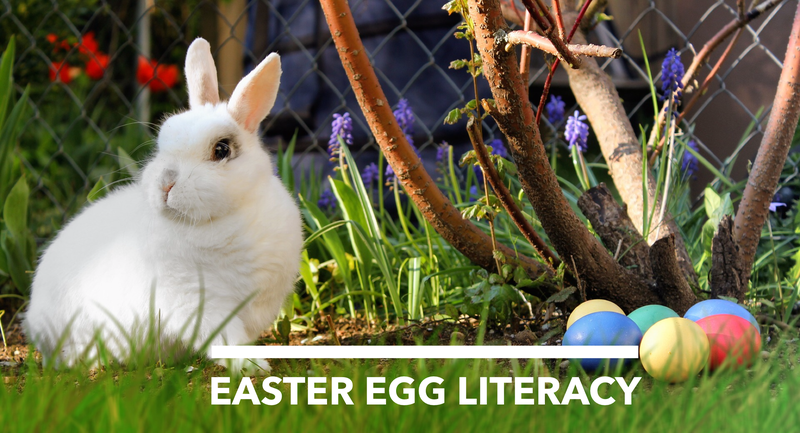 Pretend you are a bunny and hop for every letter you spell. Challenge: For one minute you have to spell everything you say. Have someone guess what you are trying to communicate. For extra fun, create an egg hunt, scattering the eggs about the room. Write each sight word on the outside of an egg. You may want to split the word by common endings. Doing so allowed my daughter to line up her letters to read the full word. 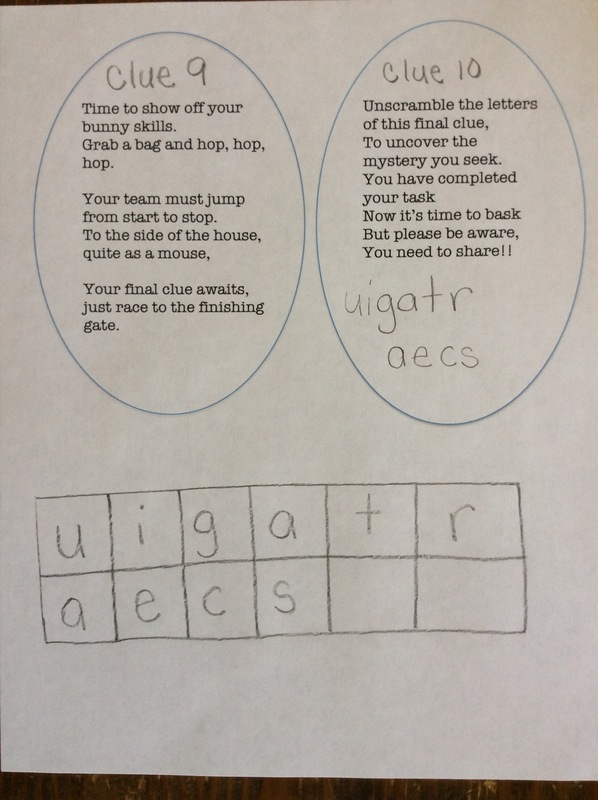 Inside each egg provide a sentence containing that specific word. Have them locate and highlight the word to practice words in print. The sentences I included were questions or funny phrases to keep my kindergartner entertained. Like the spelling practice, I hid her eggs about the room, which she loved. Today, on the go, she packed her eggs into an egg carton. She’s been carrying her sight words ever since. 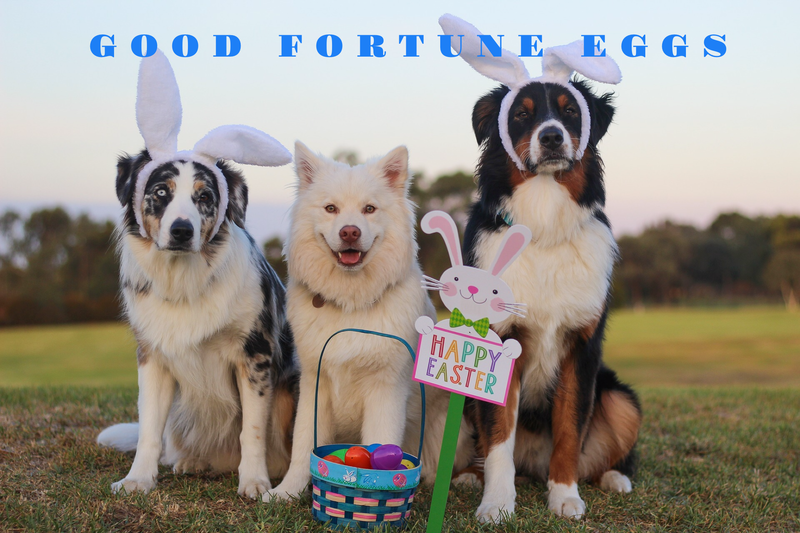 Stayed Tuned: Tomorrow I will be working on the next two Easter Egg projects : Shopping for Eggs (Learning through Math) & Treasure Hunt (Scavenger and Spy Style Easter Egg Hunt)!! !